We've been back from Colorado for two weeks. The great news: we've decided that this is where we want to move. 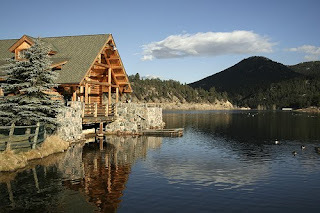 Mom managed the high altitudes of Evergreen and Colorado Springs with aplomb, in fact I was the one who woke throughout the night at two hour intervals as a result of the altitude change mixed with anxiety about the house hunt. Our search for a furnished six month rental was difficult since most homes are rented unfurnished. We did find a couple very promising prospects, however, we unable to find just the right one that would meet our price target as well as requirements for a mainfloor bedroom and easy access. As a result, the last two weeks have been incredibly stressful as from one day to the next a house that we think would be perfect is picked off by someone else or is just a little bit too expensive to meet our target. In fact, I've found the perfect house and got 'this close' to signing the lease...but the monthly rent is just a bit too expensive, so much that the anxiety of paying that much in rent rather than a house I own, literally made me sick to my stomach. How to resolve the fact that you've found the perfect house but feel stopped by the price tag? We've made one final counter offer and will keep looking while we wait. So, the good news is that we have decided on a location. We've decided on a lease date starting December 1st, we're packing in earnest, and we've even found a prospective tenant for our condo. All that's left is the most essential part, securing the home. That's the scary part, and the reason why I haven't written in so long. I'd hoped to wait until I could happily announce here that it was done and we were on our way. We're not there yet, but I decided I needed to check in and ask for your positive thoughts or prayers that we obtain the perfect home for our needs. It's time go, we're ready. How fun to come over and see this post! Of course, you have my prayers and best wishes. I'm SO excited for you. I'm sorry I've been scarce - barely writing myself. But, hopefully getting into the groove again. I've missed you & your blog.